It’s impossible to confuse the Chehalis Activators high school meet with the Penn Relays or the Millrose Games, yet for a deep-and-talented high school track and field program whose reigns had been inherited by a new head coach, there couldn’t have been a better competition/retreat at which to strengthen both chemistry and identity. And if you’d watched that very group of Ramblers this past weekend, at the 2018 B.C. 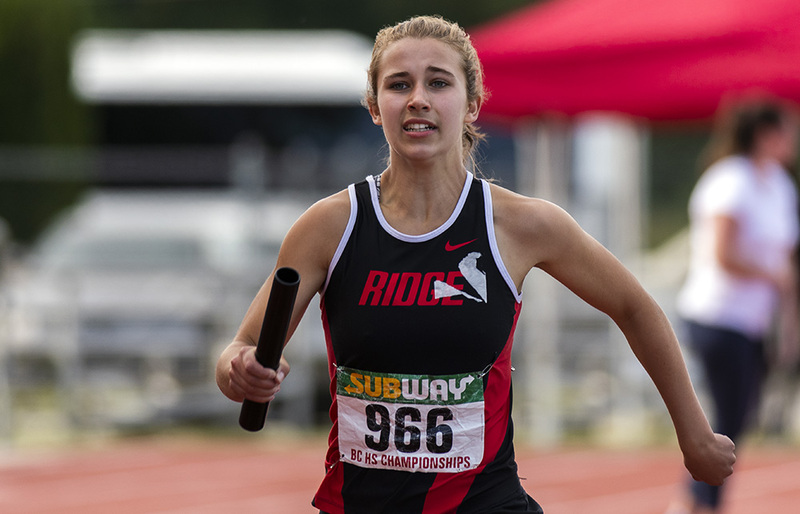 high school track and field championships at Langley’s McLeod Athletic Park, what you saw was confirmation of the fact that in the 41 days since their return, they had become a true collective in every sense of the word. 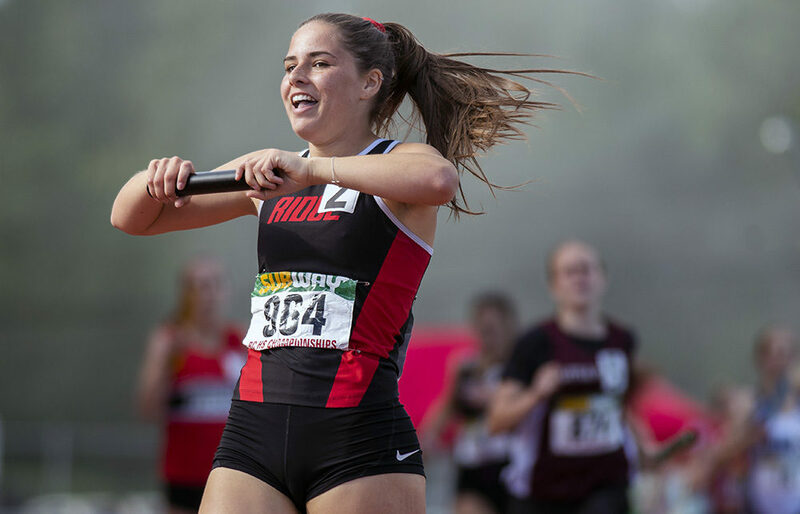 “We went to Washington specifically to come together as a team,” said Ramblers’ head coach Andrew Lenton after Maple Ridge totalled 89 points at the three-day provincial meet, 33 points more than second-place Oak Bay of Victoria, to win the school’s first senior B.C. meet championship title since 1995. “I believe in trying to build the mindset of team, because track athletes are always thinking about individual events,” continued Lenton. And it’s the details of those schematics that wound up being the keys to this past weekend’s success story. Credit must always be given its due, and in that regard, Lenton — who also wears hats as the commissioner of B.C. High School Track and Field, and as the B.C. meet director — was quick to tip his cap to former Maple Ridge head coach Ken Elphick, who last season led a young Ramblers team to the B.C. senior girls overall points title. Yet with deep numbers returning and a group of rising junior-aged athletes all converging this season, Lenton knew it would take a lot of team buy-in to truly maximize the blue-chip community of athletes that populated its ranks. And the best way to examine those schematics? If you start from the inside-out, by looking at the construction of the school’s senior girls relay teams, you get the full picture of how the building blocks of a championship philosophy were assembled. To that end, Lenton, who prior to this season had spent the past decade in the district at crosstown Thomas Haney, gleaned the best team-building traits he had observed from the likes of other head coaches like Walnut Grove’s Gary Lutes and Mike Sheffer of Oak Bay. “You look and you learn from the powers,” said Lenton of a blueprint whose roots intertwine with such past great coaches as Burnaby Central’s Ken Taylor, Dave Nichols of Surrey’s Queen Elizabeth, and Keith Butler of Oak Bay. In what may or may not be a championship-meet first, the Ramblers won the overall senior varsity title with just one gold-medal performance in an individual event over the course of the three-day main portion of the meet. Yet if that seems strange, it also seems somehow fitting that within their title-winning themes of team buy-in and overall versatility, that their three other gold medals came outside of that norm. One week previous, as the meet began with the B.C. Multi-Events Championships, Ramblers’ standout Emily Morley won the heptathlon. 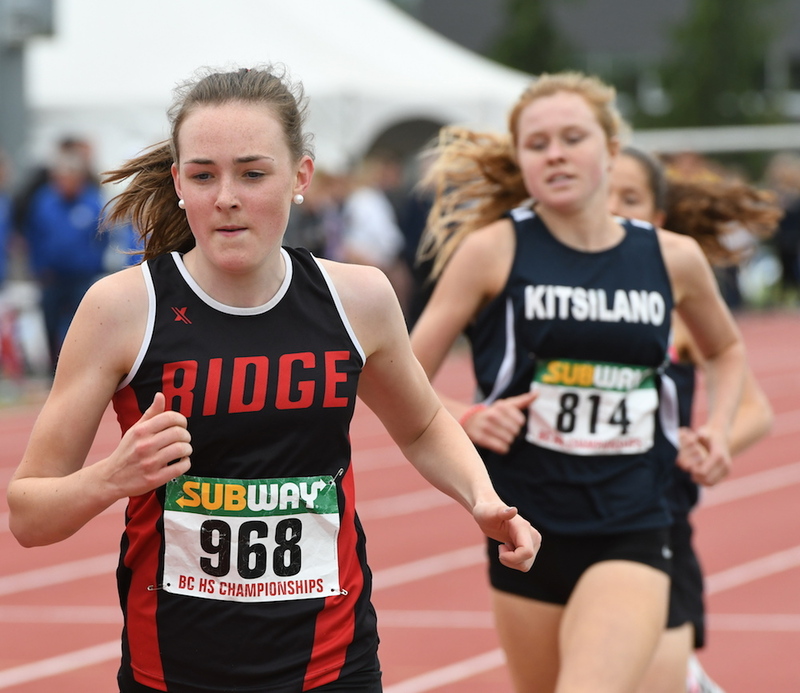 And over this past weekend, Maple Ridge’s overall depth was reflected in its sweep of both the senior girls 4x100m (49.85 seconds) and 4x400m (4:01.60) relays. The spin-off from all of that? It goes right back to that weekend at the Chehalis meet. That’s where Lenton mixed and matched, not only trying to find winning combos, but also taking advantage of his bounty of relay runners to increase performance in other individual events. To do that, Lenton took stock of his team depth and trusted in the process of their training and improvement. In the end, he actually rested his top runner in both the 4x100m and 4x400m heats, then brought them back into the fold more refreshed for the finals. “I rested Aaryanna (Kurucz), who is our fastest runner in the 4×100,” the coach said. That meant his own daughter, ninth-grade Jade, who had helped the team qualify in the heats, served as an alternate for the finals as Kurucz rejoined the starters. The NCAA Div. 1 bound Kurucz ran on both relay teams, won the 400m hurdles (1:05.09) and finished second in the 400m (57.52). Morley finished fourth in both the 400m hurdles (1:07.26) and 100m hurdles (16.36 seconds) was and even fifth in the javelin. Mina Lilleheier, who scored a pair of points for her team by finishing seventh in the 3,000m, helped her team qualify for the 4x400m final, then sat out the final. Morley, Kurucz and Lilleheier, outside of their contributions to the relays, combined to score 39 of team’s overall 89 points through their efforts in individual events. The Ramblers also got a huge contribution of 14 points in senior girls field events as Mateya Haintz finished second in both discus (36.59 metres) and hammer (50.72 metres). In the end, it was a team performance which ended a 23-year dryspell, the longest drought in between titles in the 51 year history of the meet. Perhaps even stranger, after finishing third in 1994 and then winning it all in 1995, the Ramblers did not manage a single top three overall finish before placing first this season.